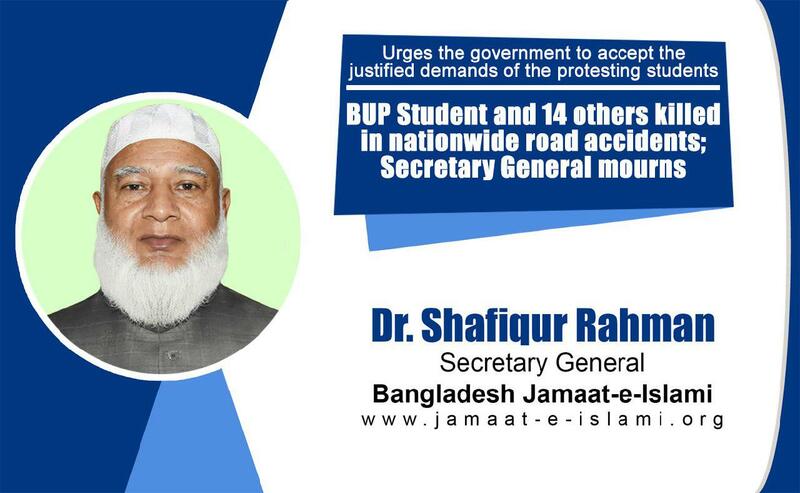 Bangladesh Jamaat-e-Islami’s Secretary General Dr. Shafiqur Rahman has issued the following statement on 20 March 2019 expressing deep shock and concern as 14 people including the meritorious student of Bangladesh University of Professionals (BUP) Abrar Ahmed Chowdhury have been killed in fatal road accidents on 19 March in various places across the country. “I am expressing my shock and concern as 14 people have been killed nationwide on 19th March including meritorious student Abrar Ahmed Chowdhury. The countrymen are saddened over these accidents. Everyday many people including women and children are being killed in road accidents. But the government is remaining indifferent in this regard. Their only target is to stay in power by holding farcical elections. They are not concerned about public welfare at all. The government is ignoring the people as they are not an elected authority. If they were that sensible, such a significant number of people could not be killed continuously in road accidents. The countrymen could remember that just 8 months back, the school going students had waged an unprecedented movement demanding road safety. The government also became compelled in those days to accept all the demands of the agitating students. Abrar Ahmed Chowdhury, who has been killed on 19 March, also took part in that movement actively. But those demands are not met yet. Road is not safe at all. The current catastrophic road management system proves that though the government was forced to accept their demands verbally, but they are not sincere to materialize those demands. The government is placing false promises just to deceive the people. We cannot expect anything better from this authoritarian government. I still hope that the government would accept all the justified demands of the protesting students and ensure road safety in proper sense in the upcoming days.